Don’t get me started on this one—I can eat these avocado toasts literally every day for a week, even more. Love. So many good flavors and textures all together, and good looks, too. 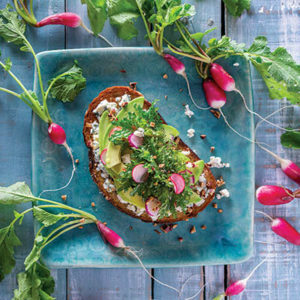 (Avocado toast deserves special treatment, after all, because it has risen to cult status.) Two fun things here: super-quick “pickled” radish slices (in lemon juice, sugar, and salt) and a drizzle of honey at the finish. With the salty blue cheese, creamy avocado, toasty pecans, and nutty baby kale, this is one satisfying supper. I use my favorite multigrain bread for this toast (the one that’s made at a local bakery but sold in the grocery store). It has a dense texture, with delicious nubbins of seeds and grains, making it the perfect foil for the richness of the avocado and blue cheese. ON-DEMAND: Listen to Faith and Susie talk about this recipe and more on The Faith Middleton Food Schmooze®. 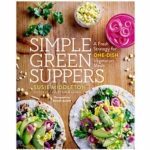 From Simple Green Suppers by Susie Middleton © 2017 by Susie Middleton. Photographs © 2017 by Randi Baird. 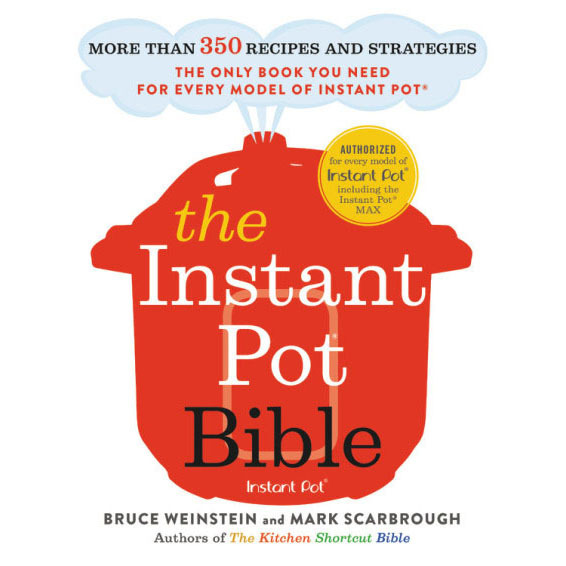 Reprinted in arrangement with Roost Books, an imprint of Shambhala Publications, Inc.
Preheat the oven broiler to high. In a small bowl, combine the sliced radishes with 1/2 teaspoon of the lemon juice, the sugar, and a pinch of salt and toss well. Set aside. In another small bowl, whisk together the remaining 1 teaspoon lemon juice, 1 tablespoon of the olive oil, and a pinch of salt. Place the bread slices on a small baking sheet and brush one side of each piece generously with olive oil (about 1 teaspoon per slice). Broil until nicely browned. Flip over and broil other side until lightly browned. While the toast is still warm, use a sandwich knife to smear 1-1/2 tablespoons of blue cheese on the olive-oil-brushed side of each piece of toast. Arrange the avocado slices over the cheese (half an avocado per piece), season with a bit of salt, and drizzle with a tiny bit of the lemon and oil mixture. In a small bowl, toss the kale with the remaining lemon and oil mixture and mound it on top of the avocado, distributing it evenly between the slices. Drain the radish slices and tuck them among the kale leaves. Sprinkle the pecans over all, and drizzle lightly with honey. (A fork is a great tool for drizzling honey. Gently rewarm your honey if it has become grainy.) Cut the toast slices in half and serve.